As the region’s population ages, analysts predict its cities will increasingly draw in the younger generations. Claire Wilde reports from Bradford, which has the highest proportion of children of any UK city. Walk around central Bradford when the schools are out and you will be struck by the number of children you see. Brothers and sisters howl with laughter as they splash each other in City Park’s Mirror Pool or manage to suspend a ball in the air on top of one of its fountain jets. Toddlers join mothers, fathers and grandparents on the miniature train which chugs around the Broadway shopping centre, while older children explore the mirror maze and other exhibits in the nearby National Science and Media Museum. 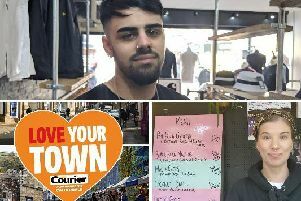 In Bradford, more than a quarter of the population is aged under 16, a higher proportion than any other city in the UK, meaning council chiefs proudly proclaim it to be the ‘country’s youngest city’. The sheer number of children is a boon for entrepreneurs keen to tap into the parental pound – a giant inflatable obstacle course being the latest attraction to open in the city centre – and has been a gift to researchers such as the award-winning Born In Bradford birth cohort study, tracking 13,500 children born at the local hospital. However, it also brings challenges to those tasked with creating more school places and budgeting for children’s social care. Official statistics show Bradford’s growing and unusually youthful population is due to a combination of a higher-than-average birth rate and a large number of international migrants, a factor which tends to be associated with younger citizens – the three towns and cities in Yorkshire with the highest proportion of children are Bradford, Dewsbury and Keighley, all known for their large South Asian populations. While Bradford may have a large number of young people, in another respect, it is not Britain’s youngest city – the average age is 36, which does not even beat nearby Leeds with its average age of 35.5. Instead, the city’s demographics show a large number of children and teenagers, a growing number of pensioners and fewer and fewer people in the middle. Bradford Council leader Susan Hinchcliffe says older people make a valuable contribution to the district and provide the “backbone of the volunteering community”, but city hall chiefs are keen to boost the working-age population, given that it drives economic growth. And there are encouraging signs, according to Coun Hinchcliffe. She points to independent research indicating a growing number of young urban residents (YURs), the term given to well-qualified 25 to 34-year-olds thought of as the wealth-builders of the future, moving into areas just outside the city such as Saltaire. One of the greatest challenges facing the city over the long-term, according to Coun Hinchcliffe, is harnessing the potential that the city’s young population offers and then convincing them to remain in the local area, so they can boost its economy throughout their working lives. She says: “Our young, diverse and growing population provides Bradford with a unique asset and potential that can drive innovation and business growth. Our young people have incredible energy and talent. “They are digital natives, in tune with a modern, globally connected lifestyle. “The wealth and success of the district will depend on our ability to retain our skilled and enterprising young people. It’s why we have such a huge focus on education in Bradford. “If all our 100,000 school-age young people are well educated then we thrive and prosper as a city. The combination of an ageing population and the drift of working-age people to major urban centres seen in recent decades will continue to dramatically reshape Yorkshire in the coming years, projections show. Analysis by the Centre for Towns think-tank for The Yorkshire Post reveals that towns and villages are forecast to become much older in the next two decades, increasing the dependency of residents on the working age population, while cities and bigger towns are expected to age at a slower rate. The trend has already been felt in the last 40 years, according to the Centre for Towns, with Leeds younger at the time of the 2011 census than two decades earlier.